Center-left coalition leader and former Chilean President Michelle Bachelet looks for a second Presidential term, focusing on themes of inequality, universal education, and tax reform. But have lessons been learned from the previous coalition terms? 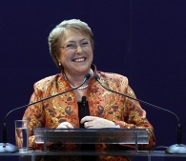 Former President Michelle Bachelet, now official center-left coalition Concertación candidate for the 2014 presidential elections has sketched out a campaign strategy based on the reduction in income inequality, “those who earn more, contribute more”, and educational reform, which she has recently suggested would be funded by an overhaul of the tax system. Daughter of the Fuerza Aérea General Alberto Bachelet, who was tortured to death by the Pinochet regime for supporting the democratically elected Marxist President Salvador Allende, Michelle Bachelet went on to become the first female President in the country’s history. Her term (2006-2010) was successful in many ways as evidenced by a December 2010 Adimark public opinion poll showing that her approval rating stood at an unprecedented 81 percent. Although running for a second, consecutive term is strictly prohibited under Chilean constitutional law, it is likely that her huge popularity would have propelled her into a second term of office. The peripety in the Chilean saga, however, came in March of that year when the country took a sharp turn to the political right after the electorate seemingly became weary of 20 years of Concertación governments. Although the causes of the demise of the coalition are myriad, a widely held conviction asserts that defeat was in large part due to a poorly received, lackluster candidate in the form of Eduardo Frei. However, several significant events were influential in the slide in popularity including the fated transformation of the public transport system in the capital, Transantiago in 2007 (scornfully known at the time as ‘transanfiasco’ by miffed Santiaguinos) and the so-called Penguin revolution in 2006 (with reference to black and white school uniforms), which at its peak saw some 700, 000 high school students out on strike and occupying schools. The latter had hinted at the fact that, even as early as 2006, the coalition had become somewhat removed from the electorate as a whole and perhaps particularly from its core base of socialist support; was the Concertación moving perilously close to the center? Perhaps. At any rate it was a clear portent of later years as the movimiento estundiantil developed into a puissant force against the deep-rooted inequalities in Chile, which are felt particularly in the education system. It is interesting to note that we are witnessing some history-in-the-making in the dynamic of the Chilean student movement. Traditionally the political and social movements in Chile have been housed within the political parties, the action played out within this party framework. Today, however, some sections of society with grievances to protest against are turning their backs on political parties and making their voice heard independently, as well as through new avenues opened up with blogging and social media. This represents a sea-change for Chilean democratic processes and it will be interesting to see how the parties react to it. Ultimately, the Concertación was defeated in the 2010 election by current President Sebastían Piñera, whose government has since suffered consistently in the polls, arguably making him Chile’s least popular leader since Dictator Augusto Pinochet. The latest poll by Adimark showing only a 38 percent level of approval for the forlorn President. Fundamentally his unpopularity coupled with several key aspects has made him impotent to govern in the more neo-liberal way that he would have wanted to. Meanwhile, a survey by Universidad Diego Portales shows that Bachelet is a clear favorite at this stage to win the primaries (73 percent) and results also indicate that she is even a strong favorite for the Presidency in 2014 (43 percent). Piñera of course is unable under the constitution to run for a consecutive term, even if he had greater support. In the wake of the Chilean student protests then, which are still continuing today, Bachelet is currently seeking the popular vote. In her acceptance speech she said, “We must guarantee everyone a public education system that integrates them at all levels, ends profit and advances toward universal gratuity…It’s the desire of most Chileans.” Whether her assertion that most Chileans desire a free and fair public education system is politically expedient or a profound realization of the nature of public will, there is some truth in it as shown by the ongoing protests, as well as a recent Diego Portales survey that indicates 19 percent of those canvassed saying that education is the single most important issue in Chile today, second only to delinquency. Nevertheless the enduring perception of the Concertación years is that on balance they have had a beneficial impact on the country. One of the enduring myths of the Concertación is that poverty has been reduced over the Concertación governments and the mechanism of action has been spending, through social programs. The inequality felt in all quarters in Chile is often expressed in the country, but it is important to point out that it is not merely subjective, a range of studies have demonstrated the point. 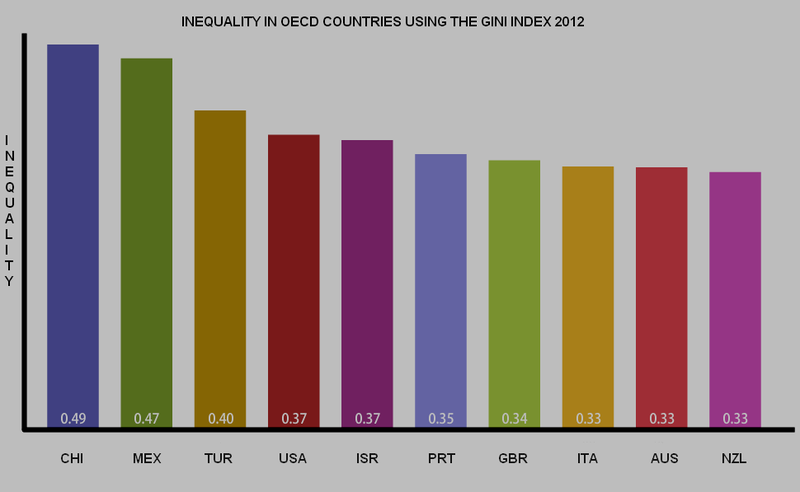 For example, the OECD, which Chile recently joined, published data on inequality measures for all member states. The results make interesting, if not confirmatory reading: Chile is the most unequal country in the OECD. Figure 1 illustrates the situation using the Gini coefficient (ranging from 0 to 1, with higher scores indicating more inequality) and shows the worst offenders. Source: OECD 2012. Data represent the Gini coefficient (0-1) where higher values represent more inequality. A value of 0 indicates a country where all the wealth is shared equally; a value of 1 represents a country where a single individual owns all the wealth. One of the problems of evaluating any government or series of governments is in the type of indices used to measure a given phenomenon. In the case of the reduction of poverty over the coalition years, there is evidence to challenge the myth. As demonstrated by Kirsten Sehnbruch and colleagues, the veracity of the claim may well depend on how one defines poverty. Chile currently uses an absolute poverty index which in essence calculates the wages necessary to buy a standard basket of goods. This index is lagged in time, updated every 10 years or so. However, this measure does not take into account any relative poverty. This makes little sense especially given the rapid economic growth of Chile that has recently seen, for example, a pouring in of foreign investment. This period of rapid economic growth in Chile that has far surpassed that of her Latin American neighbors, or the so-called “miracle of Chile” as Friedman put it, has meant more net wealth in the country as a whole and so, expectations should naturally rise for each individual; while the country is getting rich (particularly buoyed by copper sales) it is odd at best to define poverty in terms of ability to purchase basic necessities for life. The generation of wealth can and does lead to an unequal distribution. Figure 2 shows the growth in foreign investment ploughed into Chile over the decades. Source: World Bank 2013. Foreign direct investment shows total net, that is, net FDI in the reporting economy from foreign sources less net FDI by the reporting economy to the rest of the world. Data are in current U.S. dollars. So is absolute or relative poverty reducing? Source: Kirsten Sehnbruch. 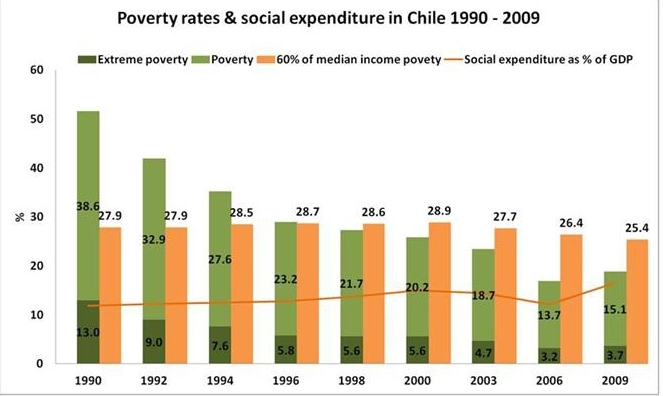 Extreme poverty, poverty and relative poverty based on 60% of the median level in Chile from 1990 to 2009. Social spending is plotted through the poverty indexes. The data from Sehnbruch et al. show that while poverty in absolute terms, including extreme poverty, made a significant reduction over time, when poverty is defined as an index relative to the average in the population very little has actually changed over the Concertación years. Relative poverty stood at 27.9 percent in 1990, rose over the years, peaking in 2000 and was stubbornly held at 25.9 percent in 2009. Even if we accept the definition of poverty reduction based on absolute terms, the proposed mechanism of action, social spending relative to GDP, has barely risen over the period. In the first eight years, which witnessed the greatest reduction in absolute poverty, social spending was virtually flat-lined. The real cause of the reduction of poverty in absolute terms of course, is likely to be the liberal economic policies implemented in the period. As Figure 2 shows, there has been steady investment in Chile for some time now. A recent example includes the Google announcement of the first Latin American data center in Chile that is purported to be worth $150 million (USD) in investment. Nevertheless, as can be seen in the OECD figures, the crude introduction of neoliberal policies and relaxation of state control has done nothing to tackle inequalities in the country. Indeed the relative levels of poverty, left untouched by free-market reform is testament to this fact. Michelle Bachelet, if re-elected, has the opportunity to redress the balance in the country where the chasm between rich and poor is only growing wider. All this will depend on a sizeable mandate from which to govern as Piñera discovered to his cost. 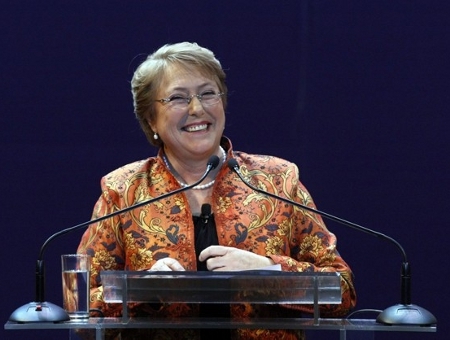 Although Bachelet herself admits that her term left “much left undone”, she may indeed have an opportunity in 2014 to tackle the inequality that plagues the nation. Dr Matthew Owens has a PhD in social science, currently works at the University of Cambridge and is the Editor-in-Chief of the online magazine chileno.co.uk.